Tender, juicy grilled pork chops that are marinated in a sweet brown sugar marinade. Then topped with a grilled pineapple ring. 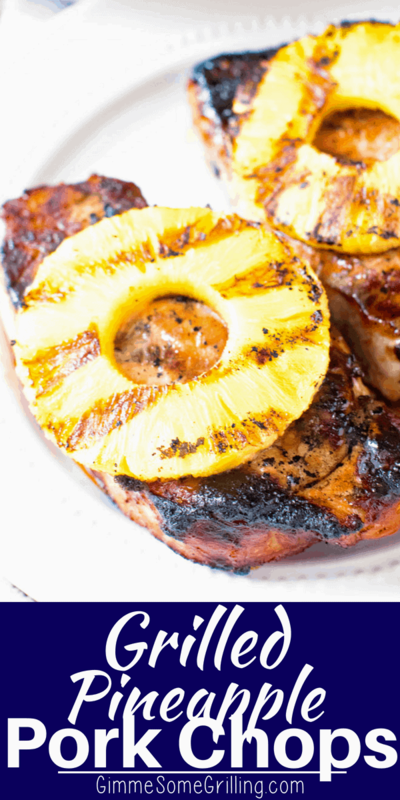 These Grilled Pineapple Pork Chops are full of flavor and so easy! 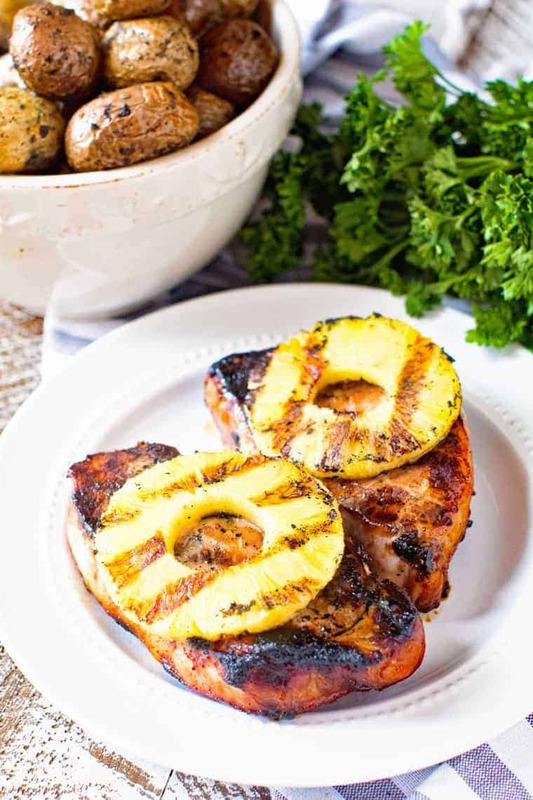 Tender, juicy marinated pork chops topped with a grilled pineapple fresh off the goal is what is for dinner tonight! How amazing does that sound? It’s the perfection of summer dining in my opinion. I’m in love with grilled pineapple so this is a win! Hey guys, how’s your summer going? I hope you are having the BEST summer and have been busy making some great family memories! I know we have! We just got done with a 9 day vacation at the cabin and it was marvelous. It’s the first time we’ve taken an entire week off and spent it together. I think it’s going to become a family tradition. What’s not to love about the cabin for a week? 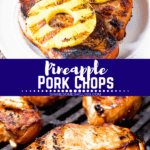 Today I want to share with you this super yummy pork chops and pineapple recipe. It’s easy, flavorful and keeps the chops so moist and tender! 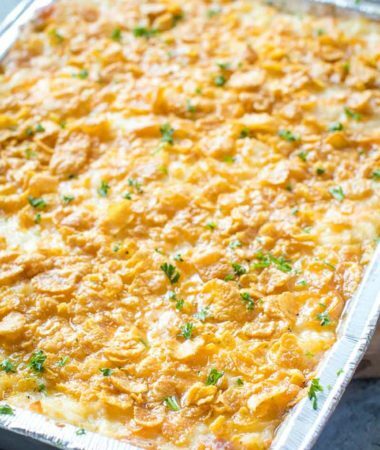 Plus, it’s perfect for a week night dinner recipe or at the cabin on vacation! 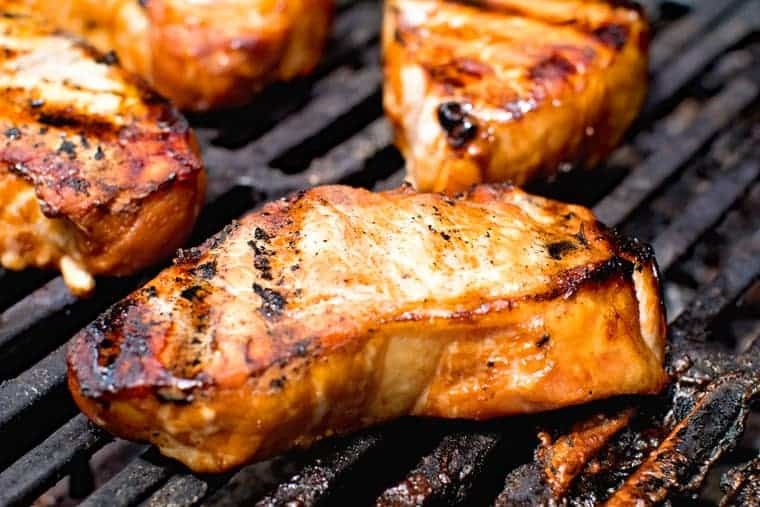 This is a great recipe because you mix up and marinade the pork the night before and when you get home from work, toss everything on the grill. Easy-peasy right? What is the best way to grill pork chops? Over medium heat on the grill. You want good grill marks, too low and they just steam. Too high and with a sweet marinade like this it will cause a flame up. You want your grill temperature to be 350 degrees. How long should you cook a pork chop on the grill? How long it takes to cook porks chops on the grill really depends on the thickness of the chop. You can give the chops the touch test by pressing on the thickest part of the meat. You don’t want it squishy, but on the other hand you don’t want it too firm either. The internal temperature of the meat should be about 145 degrees. If you’re doing a lot of grilling a good meat thermometer (this is my favorite –> Instant Read Thermometer) is a great piece of equipment. You’ll get a ton of use from it! I use it when grilling plus inside when cooking on the stovetop or oven! These chops are tender and juicy! 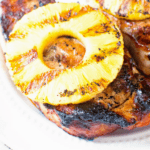 Marinated in a sweet brown sugar marinade and topped with a grilled pineapple ring. These are easy and so full of flavor!!! Can you eat slightly pink pork chops? Yes! A juicy pork chop will still be slightly pink in the middle. And remember when it comes off the grill it will continue to cook for the next 10-15 minutes when covered in foil. If you wait until the meat is white all the way thru before removing it from the grill, it will be tasteless and dry. How to make Grilled Pork Chops? Remove the pork from the marinade and grill, grilling the pineapple rings alongside. 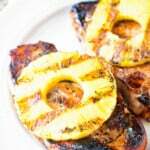 After grilling allow to rest and then serve topped with grilled pineapple! 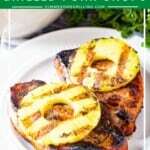 Tips for moist and tasty grilled pork chops! Choose a thicker cut of meat. Marinade or brine the chops for at least four hours, preferably overnight. Remove the meat from the refrigerator and allow it to come to room temperature before putting it on the grill. 20-30 minutes. Use a (good!) meat thermometer for best results! Don’t poke or stab the meat when flipping, all the juices will pour right out resulting in dry meat. Allow the meat to rest covered in foil after grilling. The meat will continue to cook for 5-10 minutes and more importantly the juices will redistribute into the meat. This makes the chop moist and tender! If you’re looking for a great side dish to serve alongside these chops, I served them with my recipe for Seasoned Potatoes on the Smoker. I love how the fluffy potatoes and sweet sauce with the tender pork, it’s the perfect combination, YUM! Looking for more great pork chop recipes on the grill? 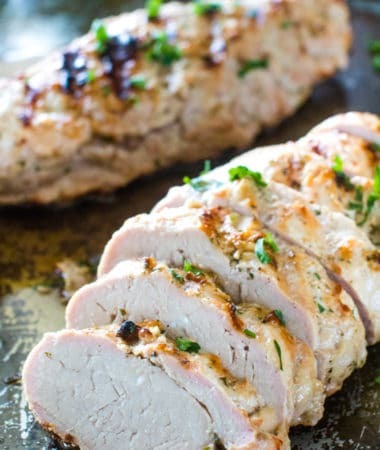 The BEST Grilled Pork Recipes! Don’t forget, comment below and let me know how much you love this meal! Post a picture on Instagram and be sure to tag me so I can see it too! I’m loving all of your delicious foodie pics! You can find me at @gimmesomegrilling or just #gimmesomegrilling -if you hashtag me, I’ll get to see it that way too! In a large plastic Ziploc bag mix together the drained pineapple juice, borwn sugar, soy sauce and garlic powder. Smush the bag with your hands to dissolve the sugar. Reserve 1/2 c. marinade. Place the pork chops into the marinade. 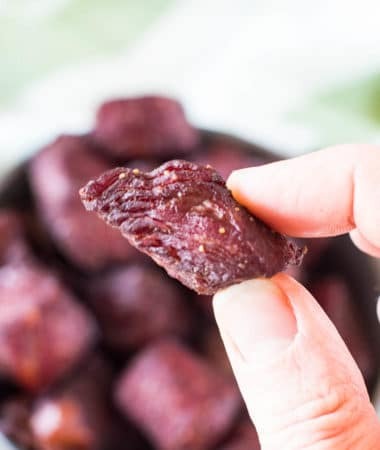 Squeeze out any air in bag, seal and place in refrigerator overnight. Reserve the pineapple rings. Preheat grill to 350 degree F. Rub grates with oil. Remove pork chops from marinade. Shake off excess. Place on grill and grill 5-8 minute per side. Brush with reserved marinated several times while grilling. 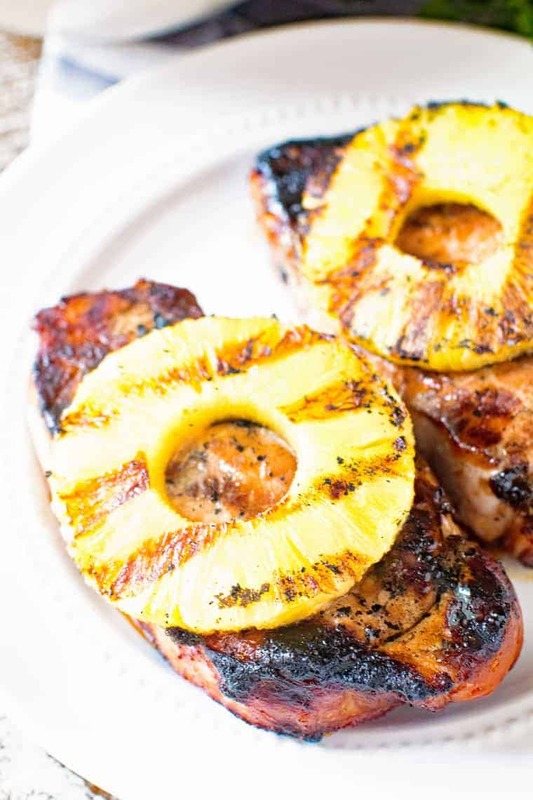 While pork is grilling place pineapple rings onto the grill and allow to cook until hot and the slices show grill marks then remove from grill. Remove pork chops from grill when internal temperature reaches 145 degrees F. Cover with tinfoil and let rest 10-15 minutes. Then top with pineapple slices and serve. Pork chops are a favorite of mine on the grill! Your temperature instructions for getting the grill marks, but still having a juicy chop are so helpful! Thanks! This looks like a fantastic flavor full recipe. Since I am diabetic I will use the pineapple rings an not the juice to marinade. A little brown sugar will be OK. Thanks for the recipe. Glad you could make adjustments for your needs! Enjoy! 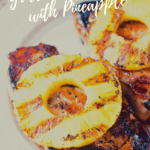 Pork and pineapple is a match made in heaven! The whole family loved it! Thanks for the fabulous recipe! Love that sweet and savory combo! What oz. pork chop are you using to calculate nutritional information, please?